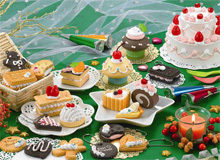 Cream pastry ornaments are a really big craze in Japan these days. You can make them yourself, and if you do it right they look so delicious they make your mouth water. But you can't possibly eat them because all those scrumptious-looking cakes, doughnuts, cream puffs, éclairs and things that seem so real are just toys. Those real-looking toy ‘sweets’ are the inspired idea of a Japanese company named Epoch Co., Ltd. 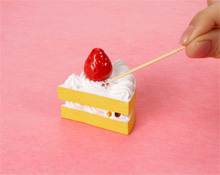 The company noticed that many women in Japan—from little girls to grandmothers—had developed a fascination for knickknacks and accessory items that looked like little cakes, doughnuts, cookies, and other pastries. It also noticed that quite a few of those women were not satisfied with what the stores offered, and had begun handcrafting their own original pastry ornaments. And so Epoch developed a series of do-it-yourself toy sets to make it easy to create pastry ornaments with a personal touch. Cream decorating toy sets include everything you need to create your own pastry ornaments. All you have to do is decorate pre-made parts that are shaped to look like cakes, cookies and other sweets with a special cream. And then add fruit-shaped parts and rhinestones. The cream is made of a lightweight clay that looks exactly like whipped cream—and actually meets the specifications for practice by pâtisserie trainees. It's very soft and smooth when you apply it, but hardens over time to make permanent pastry ornaments that you can use to decorate a room. 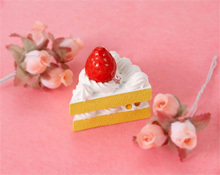 Or if you buy one of the accessory kits, you can turn those ornaments into pastry accessories to wear. 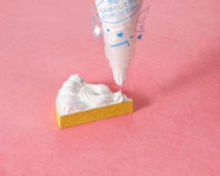 The first cream decorating toy set appeared in the spring of 2008. 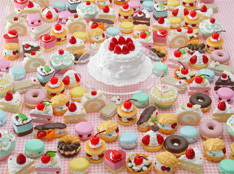 A series of sets with pastry motifs ranging from doughnuts to cupcakes quickly followed. And as of March 2009 sales had passed the one million mark! This is an astonishing success in the Japanese toy market, where a product is considered a hit if it achieves sales of 10,000 units. With the new Excellent Set you can create a total of 20 different pastry ornaments, including a decorated double-layer cake. One big reason for the immense popularity of the cream decorating toy sets is the enjoyment that mothers and daughters find in making the little pastry ornaments together. Another is the opportunity it gives young women to practice before making their own original pastry accessories. Their amazing popularity contributed to the selection of the cream decorating toy sets for an award at the first Japanese Toy Awards in 2008. They took the Excellence Award in the Trendy Toy category. Plot: Going home from his grandfather's funeral, thirty-year-old Daikichi is floored to discover that the old man had an illegitimate child with a younger lover. The rest of his family is equally shocked and embarrassed by this surprise development, and not one of them wants anything to do with the silent little girl, Rin Kaga. In a fit of anger, Daikichi decides to take her in himself. As Daikichi nurtures Rin, he started to understand the struggle while at the same time the joy of parenting. Well, well! Look's like InuYasha laid me there in the night!